Carrying on from where i left off from Day 1. 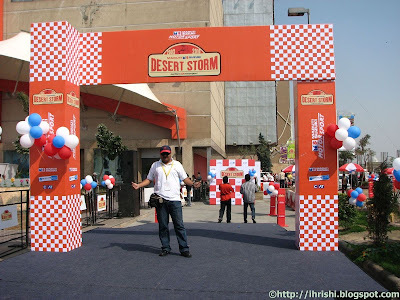 After flagging off, there was this period of confusion for me, of what exactly to do. Should i look at the Speed chart or the tulips, or both? Full marks to MV for bearing with me and his patience. Soon we settled into a pattern, and our co-ordination and communication went on improving as the days went by. Little did i know that it was the beginning of the longest day, and that it was going to turn out to be the toughest of the entire experience. All was well till we approached a tulip called Leopard Country. There due to an growing error with our GPS odometer, we took a wrong turn into a forest. A couple of kilometers in the forest, we realised that the tulips (landmarks to follow) were no longer matching, and took a U turn out of the forest. 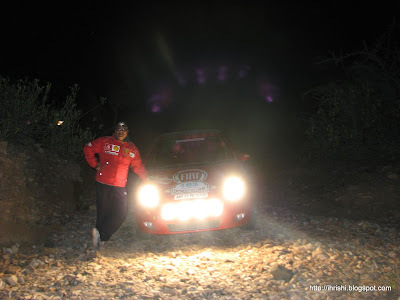 On coming back to the main road, we met up with a Santro who told us that the road ahead was blocked and the A Star guys from Team RPM, Maruti Suzuki were having a different kind of adventure. Turns out that the locals had heard a lot of cars passing by, and mistook them to be dacoits. So they just fell a tree, and blocked the entire road. A gang of 40-50 odd villagers, armed with axes, knives and swords surrounded the competitors, and demanded an explanation. Its only after a lot of pleading and cajoling that they were allowed to go. In the meanwhile, we were struggling to find our way out of the forest. By that time, 4-5 other cars had joined the party with everyone pointing in different directions. It was @0200hrs, and comfortably cold. The poor Punto took quite a beating here. 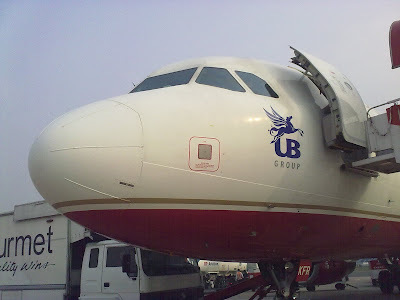 This is where we lost the first of our mud flaps, and the entire cladding of the rear left wheel arch. But hats off to the engine guard, and the tank guard, none of the stones caused any damage. 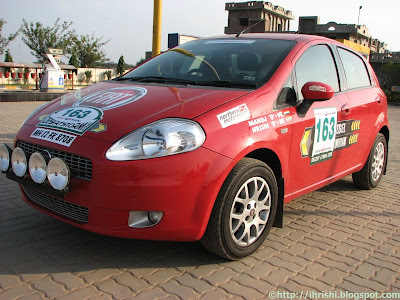 The Punto is not just a looker, its tough too. 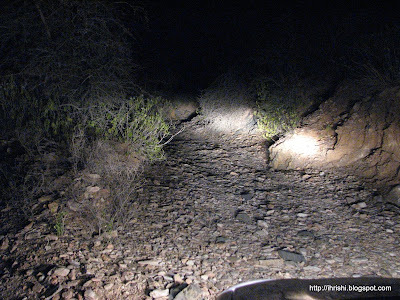 This is also where, we heard 'supposedly' big cat noises, saw jackals, deer. Was an experience. Here's the sights of the forest. This is where the road ended. Eventually, we decided to turn back and restart the entire track. And guess what? We had missed the actual turn by 15-20 meters. :-[ So much for navigation! Rest of the journey was a blur, since MV decided to make up for the lost time. I distinctly remember a patch of twisties with around 9-10 hair pin bends within meters of each other. The way we tackled that particular patch would have made other cars wet their (umm..) radiators, but the way Punto took it was really amazing. That car is a handler. I remember holding (hanging) on to the handle with both hands, all the while wishing that even i had a steering wheel to hold on to. We also made our first friends of the trip while waiting for a free zone to get over. 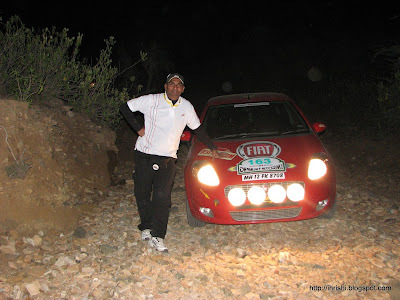 We, along with Manish and Vishal, who were driving in a Ford Fiesta, would then onwards form convoy of sorts when the rally got over, and we were kind of coasting back to the hotel every day. It was red bull that kept us awake and alert that night. But i am quite sure, that even without red bull, there was hardly ever time to even think of sleeping. there was so much to do! Calculations, re calculations, navigation etc. Soon, it was day break, and this is where i saw one of the most beautiful sights of the entire trip. 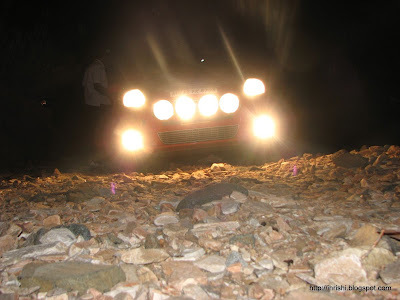 We had entered in a typical Rajasthani village, with small houses, narrow roads, sand everywhere. And Peacocks. I have seen peacocks only in zoos. And here, there were peacocks on the road, on rooftops, on gates, and even on garbage dumps. That is also when i found that peacocks are not that fast too. There were many times when we had to slow down to let one of the majestic national bird cross the road at their own pace. Damn! Why did the peacock cross the road? But this was one of the highlights of the trip, and this memory is something i will never forget. Eventually, after a gruelling night, we managed to reach Teja Garden, totally tired, drained and happy to have completed the first leg. We had a couple of hours to spare here. Once we had breakfast, and more than 3-4 cups of tea, we tried to have some shut-eye. Before we knew it, it was time to go again. 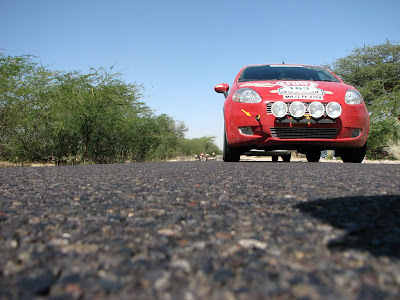 This particular leg was going to be quite short - @100 kms, and we were looking forward to reach Gajner Palace near Bikaner. 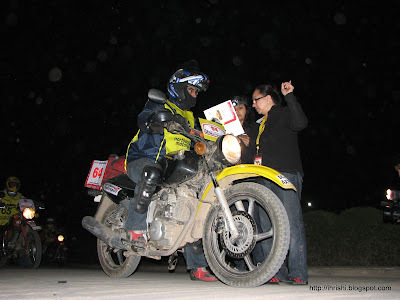 After the mandatory briefing, which set our expectations, and gave us an idea of what not to expect, we got the Road Books for the next 5 days. Leg 1 and Leg 1a were going to be the most challenging, since it was an all night drive, and since it was a first time for many people, including us, we yet had to settle down as a team. Personally, i had never read tulips before, and it was going to be a huge learning curve for me. The organizers too were having a hard time managing all the people, and setting up the start order. Ultimately, it was a First In First Out starting order, and finally we were off. Since we had a lot of time to cover, before reaching Shakunt Resort, we took our time and went at our own pace. Filled up the Punto's tank on the way. The Punto's such a head turner. Specially in the small towns, and villages, its got a universal appeal. During driver briefing, one of the competitors got hit in most delicate place with a golf ball, which lead to a lot of ball hits ball jokes. One hatch back was parked on the side of the highway, for no reason at all. This might have seemed strange at that time, but little did we realize that it was an indicator of things to come. Got quite intimidated by the level of equipment in our competitor's cars. 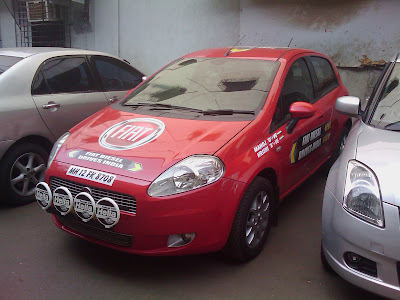 The red Italian beauty the Grande Punto! The beauty and the beasts? 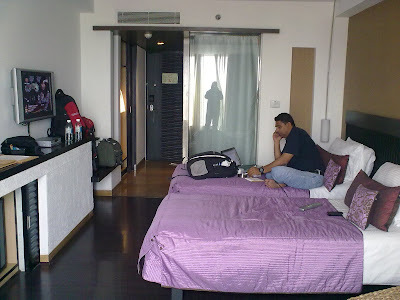 @1800hrs and reached home @0515hrs today morning. Had a whale of a time. Lovely experience.. 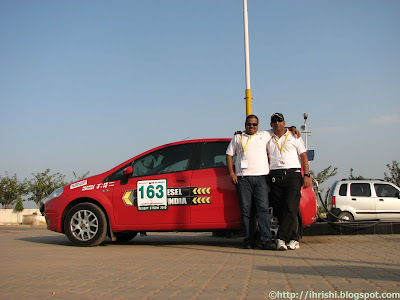 Since we had already finished our scrutiny yesterday, we had ample time to pamper the Punto today. 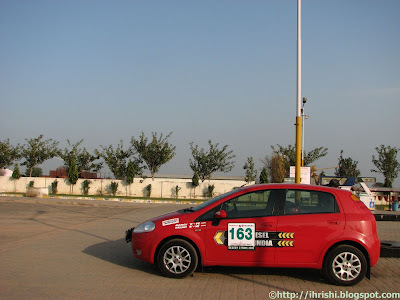 So off we went (in circles) to search for a fiat workshop in Noida. After many turns and u turns, finally managed to find it. The works manager there was kind enough to help us jump the queue for a thorough checkup of the vehicle. MV chips in with the TLC. got off, and was well on my way to the airport before my planned time. Delhi on time. 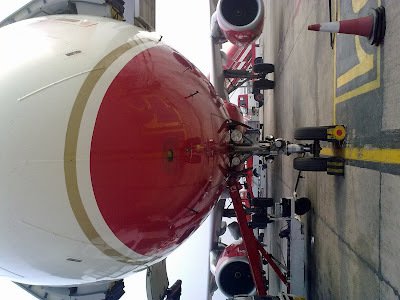 Walked out of the airport directly to the red beauty. The Punto still manages to take my breath away every time i see her. India Place - a huge mall. show real time locations of the car on their website. So, as of right now, we are all set for the rally..
pyaari car hai" is the most commonly used statement, across all ages. started a conversation... Its so different and nice. Following are a few pics from today's experience. 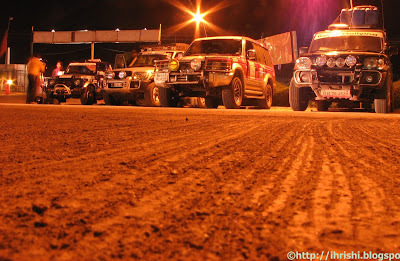 Motoroids.com - India's best online auto mag, is covering our attempt at the Maruti Suzuki Desert Storm. And on a side note, have a look at the member of the month.. There are myriad feelings going through me right now. On one hand, as is the norm, sleep is totally evading me. On the other hand, the butterflies have made a grand appearance. I have not felt like this since a long long time. 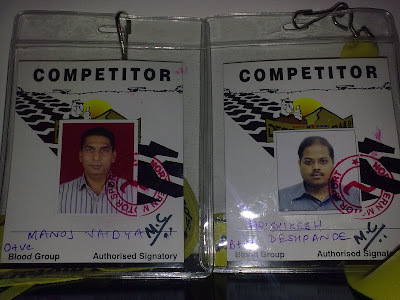 This being my first competitive rally, am quite apprehensive of what to expect. Theoretically, im all good. But when it comes to putting it all together, I just hope that it doesn't unravel at its seams. So, in a few hours time, the experience will start off. I hope I have all good news at the end of this adventure! Krish got his first pair of wheels. A nice sparkling red Firefox Demon. The bike is personally chosen by him after test riding Raleigh's, BSA's and other local brands. He's quite chuffed about this new addition, and needed some persuasion to get off the bike to sleep today. How often does a dream come true? Well, I can see one of my wildest dreams coming true. Hold your horses, I'm not off for a weekend with Ms Kaif. Its something even better. It sure is going to be a very sharp learning curve for me, as well as a very different experience. I had never imagined participating in a real rally before. The fun has already started, with the planning and preparation for this. There is a lot of paperwork involved, like getting rally licenses from the FMSCI, certificates from the doctor, indemnity bonds from the lawyer, insurance from the broker....you get the drift. Paperwork is one thing. The actual challenge will be when driving over sand, water, beaches, dry lake beds, near the POK border, next to an extinct volcano somewhere in Rajasthan. Some of these things are on moonless nights just to make things interesting. Just hoping that we don't face something like that in the real deal, where a tyre is supposed to be changed in 3 mins. I am not going there just to participate. 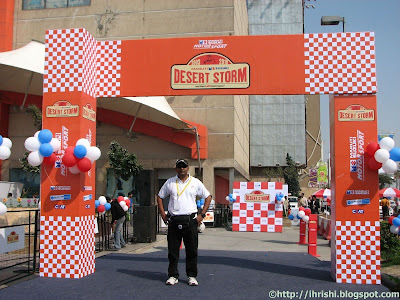 I am going there, and will give it my best shot for a podium. So, wish me well, and hope that I come back with a rally classification.